4 October 2017 – On 28 September 2017, Bahrain’s king appointed his son, Sheikh Nasser bin Hamad Al Khalifa, to serve as a member of the Supreme Defense Council (SDC) despite credible allegations he directly tortured detainees in 2011. 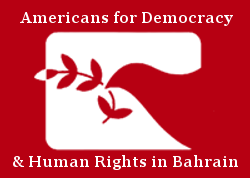 Americans for Democracy & Human Rights in Bahrain (ADHRB) strongly condemns Sheikh Nasser’s promotion to one of the kingdom’s top security posts and reiterates our call for an independent, international investigation into reports of severe human rights abuses perpetrated by high-ranking government officials in Bahrain. The SDC – which is made up exclusively of royal family members including the king, the crown prince, and the prime minister – is considered to be the country’s highest defense authority and presides over major national security decisions. Like the larger security apparatus in Bahrain, the kingdom’s Shia Muslim majority population remains virtually excluded from the SDC. Sheikh Nasser’s appointment further advances his position in Bahrain’s security establishment after he assumed command of the Bahrain Defence Force (BDF) Royal Guard in June 2011. A brigadier-general educated at the United Kingdom (UK)’s Sandhurst military academy, Sheikh Nasser personally led a contingent of the Royal Guard’s Special Forces as part of Saudi Arabia’s coalition in Yemen, which has been repeatedly accused of war crimes that have deepened the humanitarian crisis in that country. In addition to his military career, Sheikh Nasser is also a leading figure in Bahrain’s athletic bureaucracy, serving as head of the Bahrain Olympic Committee, the Bahrain Royal Equestrian and Endurance Federation, and the Supreme Council for Youth and Sports. The current secretary-general of the SDC, Lieutenant-General, Sheikh Daij bin Salman Al Khalifa, cited these “numerous landmark achievements in the humanitarian, charitable, military and sports fields” as evidence of the “key patriotic role” Sheikh Nasser has played in Bahrain, and the primary grounds for his new appointment. Yet, in each of these fields, Sheikh Nasser’s record is marred by egregious human rights abuses. Following the government’s violent suppression of the 2011 pro-democracy movement, credible evidence emerged that Sheikh Nasser directed the arbitrary detention and torture of protesters, opposition activists, and athletes. In his capacity as the head of the Olympic Committee, Sheikh Nasser created a special commission to identify and punish more than 150 members of the sporting community who had peacefully demonstrated. He indicated that the commission was specifically intended to carry out reprisals, publicly calling for “a wall to fall on [protesters’] heads … even if they are an athlete…Bahrain is an island and there is nowhere to escape,” and tweeting “If it was up to me, I’d give them all life [in prison].” Two opposition leaders and members of the Bahrain 13 – a set of prominent prisoners of conscience initially imprisoned by military courts in 2011 – have also reported that Sheikh Nasser personally tortured them at the Ministry of Interior’s facilities in Manama (such as Al-Qala’a). Opposition figures, including Mohammed Habib al-Miqdad, accuse the prince of flogging and beating them all over their bodies for nearly 12 hours, among other abuses. In 2014, the High Court of London even ruled to overturn Sheikh Nasser’s royal immunity after a Bahraini refugee under the name “FF” brought a case against him in the UK. Like al-Miqdad, FF alleges that Sheikh Nasser was involved in torture. The Government of Bahrain continues to dispute the allegations. This is not the first time that the Bahraini government has appointed an official accused of torture to the SDC, however. In November 2011, after the Bahrain Independent Commission of Inquiry (BICI) found that the National Security Agency (NSA) – the kingdom’s chief intelligence body – was deeply implicated in torture and extrajudicial killing, the king removed its director, Sheikh Khalifa bin Abdullah Al Khalifa, and stripped the institution of its law enforcement authority. However, rather than launch a full criminal investigation, the king proceeded to appoint Sheikh Khalifa secretary-general of the SDC and a personal national security advisor with a ministerial rank. Moreover, in January 2017, the king restored arrest powers to the NSA without making any apparent institutional changes, reversing one of the only BICI recommendations to be fully implemented. The NSA has almost immediately resumed its old practices, targeting civil society actors, like human rights defender Ebtisam al-Saegh, for arbitrary detention and torture. It is unacceptable that another official deeply implicated in human rights violations will sit on the SDC with the authority to directly influence all aspects of Bahrain’s security establishment. We therefore reiterate our statement at the 36th Session of the United Nations (UN) Human Rights Council, calling on the Government of Bahrain to allow for an independent investigation into allegations of torture by Sheikh Nasser bin Hamad Al Khalifa and all other senior officials accused of abuse. ADHRB additionally calls on Sheikh Nasser to be suspended from high-ranking security positions pending such investigation, and urges the Government of Bahrain to immediately permit independent UN rights experts like the Special Rapporteur on torture to visit the kingdom.